Though most manufacturer’s claim that their portable generator model has a plug-and-go system, this is rarely the case. To properly install a portable generator, whether it is a home backup generator or a generator for RV trips, you need certain accessories. Ease-of-use and safety are the two most important factors you need to consider when purchasing any type of generator. Some accessories are essential for safe operation, while other accessories simplify the maintenance and startup processes. Have you already picked out a portable generator and are now looking for the best accessories? 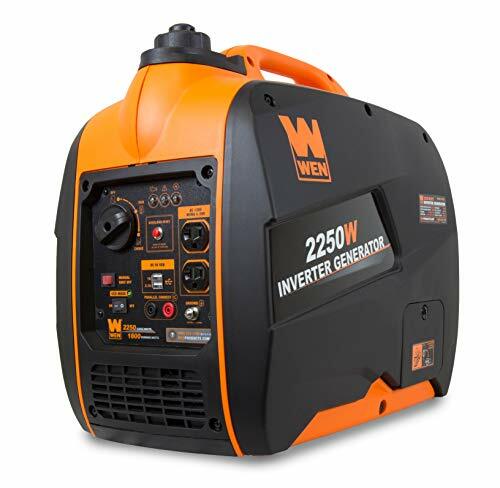 We’ve put together an overview of which kind of accessories you definitely need and which portable generator accessories are nice to have. Read on to find out what which accessories you should install on the portable generator itself or as part of this backup electrical circuit. If you haven’t decided on a model yet, check out our list of top picks, then come back to this article. Accessories is perhaps not the best label for these additions. These items play a vital role in making sure the electrical circuit is complete and the portable generator runs as safe as possible. Some of these items are a little pricey but don’t try cutting down the costs by getting an alternative of questionable quality. Choosing a low budget option over a trustworthy option is never a good idea when it comes to portable generators. The truth is that when you are looking for a portable generator, you also need to budget in for safety parts and installation costs. Refer to the article on portable generator costs for more details on how to budget for a generator. Here are the portable generator parts and accessories that are unmissable. It can never be stressed enough how important a transfer switch is. A transfer switch should always be installed for home backup generators and RV generators. A transfer switch changes the load from one electricity source to another. In this case, the transfer switch changes the load from either the main electricity supply to the generator or vice versa. The transfer switch prevents having two power sources feeding into the circuit at the same time which is extremely hazardous and can even be deadly. In the United States, a transfer switch is a legal requirement for portable generators hooked up to a home or other building type. There are two types of transfer switches; an automatic transfer switch and a manual transfer switch. Both types are good so the choice between them is really a matter of preference. The name already explains it; an automatic transfer switch self-activates the connected portable generator while shutting of the connection to the main electricity supply. It also automatically shuts off the portable generator when the regular electricity supply comes back on. An automatic transfer switch makes switching electricity sources a hands-off experience. This is the better option when you need the electricity to constantly stay on, even when you are not at home. An extra advantage of an automatic transfer switch is that you can pre-install which electrical appliances are connected to the portable generator and which devices are not. This is especially useful when you have a portable generator with less power or if you want to keep the load low for a longer run time. The disadvantage of an automatic transfer switch is that the installment is more difficult and expensive. A transfer switch should be installed by a professional anyway but with an automatic transfer switch the installment may take an hour or so longer than installing a manual transfer switch. A manual transfer switch, just like it suggests, does not automatically change electricity sources. With a manual transfer switch you need to flip the switch yourself, including all the required steps before and after. Changing from the main electricity supply to the power of a portable generator is a precise process. Always exactly follow the instructions provided by the technician once they have installed the transfer switch. It is recommended to spread the electrical devices over several circuits but using the same main transfer switch. This lets you manually adjust which devices you want connected to the portable generator and which devices you prefer not to run. Fuel-powered portable generators must be placed at least 15 feet away from any buildings with the exhaust releasing the fumes away from any windows, enclosed spaces, doors etc. Since the main electrical panel is generally attached to the building, extension cords are needed to make the connection. For safety reasons, we recommend using heavy-duty extension cords that can handle extreme weather conditions. You don’t want the connection to fail when the main electricity supply has been cut off because of bad weather. Another requirement is that the extension cords have the same amperage as the generator demands. You can usually find the amps required on the outlet of generator. Note that most portable generator have several outlets of varying amps. Also, the extension needs to have two different plugs, one that fits in the portable generator outlet and one that fits in the transfer switch outlet. Finally, the extension cord should also be long enough so calculate the distance that needs to be covered carefully. Also, consider how the length and thickness of the extension cord affects the resistance. There are some calculations involved with finding the right extension cord for a portable generator. It is best to consult the specialized technician that is going to install the transfer switch on which extension would work best. Though maintenance is minimal for portable generators, some servicing is needed to make sure everything still runs smooth. The same place where you bought the portable generator also sells maintenance kits. New spark plugs after every 100 hours of use. Oil change every 50 – 60 hours of use. With every oil change the oil filters should also be replaced. Air filters should be replaced once or twice a year depending on how often the portable generator is used. Aside from these four steps the entire portable generator should be thoroughly cleaned to makes sure no dirt or soil gets stuck anywhere and to prevent rust. While you are cleaning the machine, check for any oil leaks, as well. If you have a portable generator with a push start or electrical start, check the battery, as well. Make sure the battery is not damaged, corroded or leaking. The fuel stabilizer is an essential accessory for portable generators running on gasoline or diesel. The fuel stabilizer keeps the fuel inside the tank in good condition and prevents damage from the fuel turning into gum or causing corrosion. When you don’t have a fuel stabilizer, the portable generator’s fuel tank must be drained when not in use. This can be quite a hassle for many portable generator models so using a fuel stabilizer is the more user-friendly option. Fuel stabilizer should be added at the same time as the portable generator is being refueled. This is because the fuel stabilizer cannot make stale fuel fresh again. Worried about storing fuel inside the portable generator? If the fuel stabilizer has been added simultaneously then the fuel should stay fresh for several months. Obviously, a fuel stabilizer is not necessary with a solar power generator or a portable generator that is connected to a natural gas supply. If you are using the portable generator in a cold environment then you will also need a cold weather kit. A cold weather kit has all the items you need to make sure that the portable generator can still run smoothly and is not damaged by low temperatures. The two key parts to protect in cold weather are the oil and the battery. A battery can stop working when it gets too cold and the oil can become thicker. A battery needs more current to start properly when subjected to extremely low temperatures. A cold weather kit contains a battery heater that is activated by low temperatures. When oil thickens because of cold weather, it cannot move through the portable generator properly. To keep the oil thin and running smooth, a cold weather kit has an oil heater. Aside from the essential parts, there are also additions to a generator that make it easier to use. These are the kind of accessories that make it easier to start the portable generator, provide extra protection or make it easier to move. Fuel-powered portable generators are loud, especially the ones that have more power. Manufacturers are aware of this so there is some thought put into reducing the noise but most designs are still louder than you’d hope. If the generator is too loud for you, you can add mufflers or silencers. There are generator-specific silencers and mufflers available on the market but you could also have a car muffler modified to fit the portable generator. If you do choose to modify a car muffler, let a professional handle the conversion. A car engine does not work in the same way as a portable generator so there are a lot of technical details to consider and execute safely. If you wish to use the portable generator in public spaces like a camping ground, check whether there are any regulations on noise. This gives you an indication of how necessary it is to fit the portable generator with mufflers. There is still the occasional portable generator design that does not have push start, also called an electrical start. In some cases it is still possible to install a push start. A portable generator with only a pull start is more common with the low power portable generators that can be hand-carried. The reason why they only have a pull start is to cut down the weight and dimensions of the generator. A push start requires a battery which is reasonably heavy. This is why only the larger portable generators tend to have a push start. If you like, you can still install a push start by fitting the generator with a battery. Again, have a specialized technician make this adjustment. A more advanced starter for portable generator is a remote wireless start. These portable generators can be started from a distance by simply clicking on a remote key. A wireless remote start is most useful for portable generators to be used on work sites and for people that place the portable generator very far from the home. For elderly people or less mobile people a remote wireless start makes it much easier to get the portable generator running. A specialized technician can install a system that allows for a remote wireless start. It does depend on the electrical specifications of the portable generator whether this is possible. Portable generators that remain outside, even when not in use should have a weather-proof cover. This cover protects the portable generator from getting wet and any dirt building up. Portable generators are not waterproof and are susceptible to damage by weather conditions so a good quality cover is a good protective layer. Even better would be to store an idle portable generator indoors but this is not possible for everyone. Very large and heavy portable generators are more difficult to move around so it is easier to have keep it safe and sound in one spot with a weather-proof cover. Installing a portable generator must be done with care and with the appropriate parts. They are very useful machines but they can be even easier to use and longer lasting thanks to a few accessories.